It’s autumn of 2006 and I’m now in the second year of my active rebellion against banal Microsoft PowerPoint abuse. Looking out over business and government across America, I see my efforts are having the expected effect, that is, none at all. But that doesn’t matter and I will continue to fight in my own small way for what is right. I will continue to make my presentation slides my way just on principle, even if no one else cares, or they it’s not so much they don’t care, but have concluded I’m a moron. Here then is my PowerPoint manifesto, my ideology for more usable and effective and, frankly, less boring presentation slides. I don’t believe a PowerPoint presentation should just be an outline of the talk. If I’m a halfway decent public speaker, people should be able to follow the structure of my talk without seeing an explicit indented outline. I don’t believe the purpose of slides is to summarize what I’m saying. If I’m a halfway decent public speaker, I should summarize verbally what I’m saying in way that the audience knows I’m summarizing. I don’t believe a bulleted list is always the best way to communicate information. A bulleted list may be used to communicate a list, but not every block of information is a list. I don’t believe the slides should be my crutch to remember what I was going to say. I should use my own personal notes, not confuse the audience with what I need to see. I don’t believe that the slides should be used to supply the audience with take-home notes on the talk. The audience can take their own notes, or they can have a copy of my notes. I don’t believe that a person must be able to get the basic content of a talk just from reading the slides. If people want the content of the talk, they should listen to the talk. If they can’t, I’ll give them a written report or my notes. I don’t believe in giving out a copy of the slides to those who want just a quick overview of the topic. A written abstract or executive summary is the best way to communicate the main points for those short on time. I don’t believe I need to remind the audience of my name, my affiliation, my sponsor, my organization’s slogan, the date, the place, etc. on every slide. I put that kind of stuff on the title slide and move on. I believe humans can process information verbally and visually, often at the same time. The best presentation optimizes use of both channels to communicate. I believe that indiscriminate use of bulleted outlines not only makes presentations boring, but also deprives the audience of the true facts in all their richness. How much would you really understand from the TV news or a film documentary if the images were confined to an outline? I believe that if an audience can get all that I have to say from the slides alone, why should I bother saying anything? I can just sit there enjoying a pint of bitter and periodically clicking the mouse. I believe the Primary Purpose of slides is to supplement with visual information the information I convey verbally. 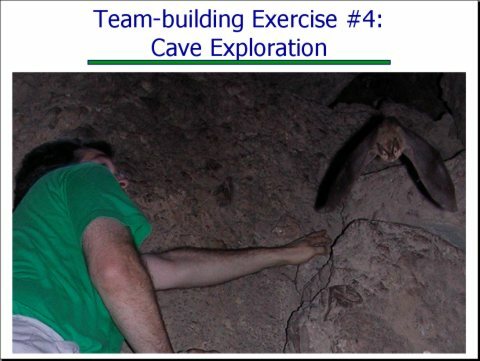 I believe that attempting to make slides serve other purposes such as providing take-home notes to the audience usually undermines their effectiveness in fulfilling their Primary Purpose. I believe that slides should, in a word, illustrate a talk. I believe slides should mostly contain pictures, photographs, diagrams, charts, figures, tables, graphs, names, formulas, terms, comics, and, yes, the occasional outline or bulleted list. Each medium should be selected to best show what I’m talking about. I believe the content of my talk is sufficiently interesting that I don’t need to resort to gratuitous animation to keep my audience awake. Indeed, this distracts the audience from what I’m trying to say. I believe my master slide should be simple and elegant, without graphics or words that interfere with my content. If my master slide graphics are more interesting than my content graphics, there’s something desperately wrong. I believe that a slide can be used to emphasize a statement, but an appropriate visual image is more compelling than any item buried in a bulleted outline. If a listener misses a word or phrase I’m saying, an image that compliments the speech will fill the gap as well or better than simply repeating myself in writing. I believe that the PowerPoint Notes pages are precisely the place to put descriptive and explanatory information for both myself and anyone who gets a copy of my slides. I accept that preparing slides this way takes additional time and care. You cannot simultaneously select and outline your content, make the slides for the presentation, and prepare notes and an executive summary for your audience. However, the result is slides that enhance a talk, not repeat it. You get the picture? I mean, so to speak? I should point out this is a manifesto is intended for professional presentations such as to a prospective client, to project team members, or at a conference. It doesn’t necessarily apply to presentations to your company’s VPs or to classroom lectures for your average students in high school or college. Let’s be honest, those guys aren’t really listening to you. They’re thinking about getting a keg, getting plastered, and, they hope, getting laid, and that’s just the VPs. That’s different from a professional presentation where if your audience isn’t interested in what you have to say, it probably doesn’t need to hear it –in fact, they probably wouldn’t be there at all. Professional audiences are a much better judge of what’s useful for them to learn (with the exception of certain VPs who assume anything presented by underlings is probably not worth their full attention). For disinterested audiences such as that, you probably need to repeat yourself on the slides so these listeners have some chance of maybe catching some of the content. Like any tool, PowerPoint can be used for good or evil. It’s not MS’s fault people use only the outline. I think defaulting to an outline format just reflects the fact that the outline was the most common single format for transparencies long before Powerpoint, although I suppose that by making it just about the only fully supported format, it has encouraged people believe it’s the only proper visual form out there. It’s not MS’s fault that people abuse the master slide or animation, loading their slides up with gratiutous elements. I mean, just because MS provides over-designed atrocious templates, 15 different kinds of animation, and even canned presentations through the AutoContent Wizard…. Okay, it’s a little MS’s fault. But at least they’re doing something about it: PowerPoint in Office 12 will support an expanded diagramming capability, making some diagrams as easy to make as an outline. With these new diagram-supporting tools, maybe people will start choosing the right graphic for the right content. Or maybe not. I suspect that most people are so used to using PowerPoint slides as a combination of personal notes, executive summary, and tool to plan a talk, that they’ll be reluctant to add diagrams. Or, they’ll add diagrams, but only because they look cool, not for any real communication benefit. Like the PowerPoint’s AutoContent wizard, the diagramming tools may just end up being something else that users follow indiscriminately. 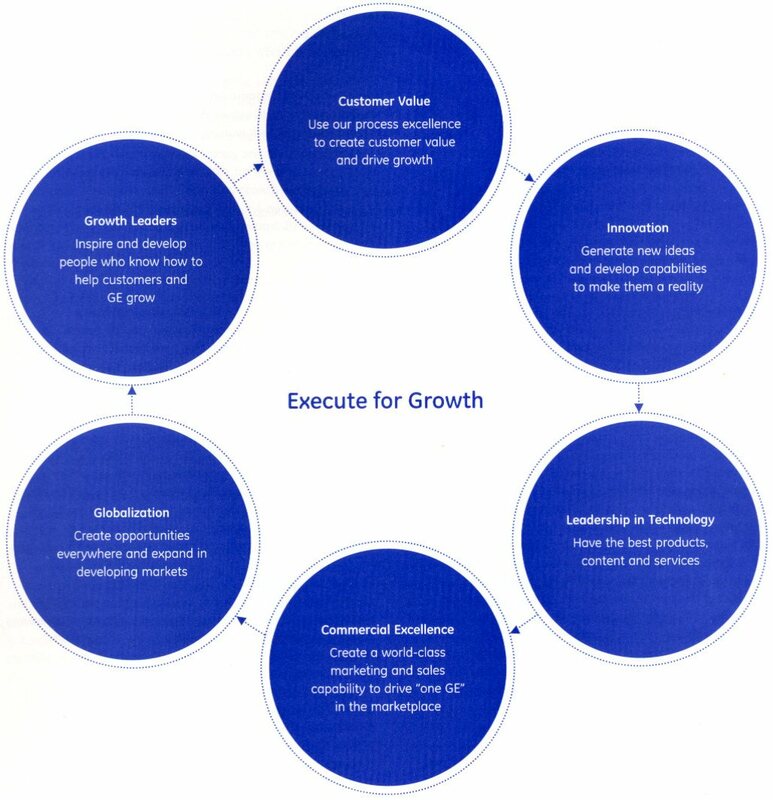 Take for example this diagram that appeared in an annual report I received (click for complete diagram). What the heck is the ring of circles and arrows supposed to mean? 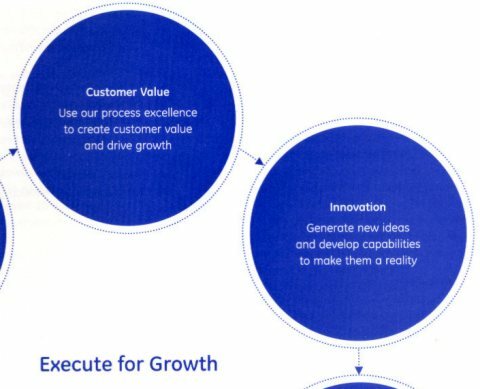 I guess I can see how making Growth Leaders can lead to Customer Value (although that’s not what the Customer Value circle says), but how does Customer Value lead to Innovation? And how does Globalization make them more likely to create Growth Leaders? Wouldn’t Growth Leaders encourage Innovation as much as Customer Value? This content probably should be arranged as a list, but they put it in a diagram with arbitrary arrows, because, well, apparently because they just thought it would look cool. Maybe I should sell my stock. Maybe this is going to be a long fight. Now my PowerPoint Manifesto in PDF in all its Deutsch Gothic glory! Download and nail to a conference room door near you! This entry was posted on Saturday, November 4th, 2006 at 4:33 pm	and is filed under Non-HCI. You can follow any responses to this entry through the RSS 2.0 feed. Both comments and pings are currently closed.